Nintendo’s Game & Watch series were all the rage in the ‘80s. They were sleek, hand-held devices you carried in your pocket, and as soon as you whipped it out, all your playground friends would be glued to your shoulder. It’s a business card holder in the guise of the game console, so although you can’t work on your high-score, you can certainly impress (or shock?) employers with your awesome geek-cred. Created by Namco Bandai susidiary Ban Presto, it’s a sleek aluminum case with a dual facade: a classic Game & Watch on one side and an old school Nintendo game controller on the other. Business cards are one of the most important tools of networking in Japan; presentation is everything. So if you’re looking to turn heads, a Nintendo card holder just may be your ticket. Japanese toymaker Bandai has just come out with A.i.R. (Art in the Room) Project, a digital art lighting scheme for modern homes. I can’t imagine the likes of Play-Doh doing this; but in Japan, companies known for kids’ toys sometimes experiment with higher-end products and markets. I love the creativity that results! A.i.R. is a combination of sensors, artwork, and useful ambient lighting. 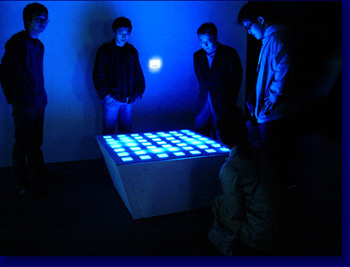 The lightbox is about the size of a laptop computer and contains 25 small, separated, bright blue LED panels that pop with light in various patterns based on the wind or the movement of your hand (sort of like the electro-ball, the light gravitates toward you). You can also use a timer and freak out your guests when the lights suddenly come on. A.i.R. was created by media artist Taro Suzuki. Retail price is around $570. At that price I doubt people will be buying one for each room — or at all, heh — but it sure looks awesome, doesn’t it? ?